January 19, 2019 3:39 pm. Round 1 Of The Al Ain Marathon Series, a 3200m Purebred Arabian handicap, was the official feature at Al Ain on Friday and developed into a duel over the final 300m between last year’s winner Shamikh Al Wathba and Hareer Al Reef. Committed for home leaving the home turn by Fernando Jara, Hareer Al Reef looked likely to be swallowed up by several challengers throughout the straight, but kept fighting them off before the eventual runner-up loomed large as a serious danger. Despite the urgings of Richard Mullen, Shamikh Al Wathba was never quite able to get on terms with Jara’s gallant mount, crossing the line with half a length to spare, completing a double on the card for trainer Abdallah Al Hammadi and main owner Al Ajban Stables. Trainer Ernst Oertel, main patron Khalid Khalifa Al Nabooda and the retained jockey Tadhg O’Shea seldom leave Al Ain empty handed and struck with AF Al Baher, who hit the front about 450m out in the 2000m handicap and stayed on dourly to the line, winning relatively comfortably in the end. An hour later, AF Saabah looked likely to complete a double for connections in a 1600m maiden before, having travelled supremely strongly for O’Shea at the head of affairs, suddenly seemed to tire with less than 200m to run. That provided Gerald Avranche all the encouragement he needed and he found a willing partner in Kawthar Al Reef, who powered home to land the spoils and initiate the brace for Al Hammadi and Al Ajban Stables. A 4-year-old filly, she was well held on her only previous outing when seventh in a 1200m maiden on the Abu Dhabi turf. The only Thoroughbred contest, a 2000m handicap, looked very competitive on paper and that proved to be the case with the lead changing hands at least five times during the duration of the long straight. Strong Chemistry led throughout the first half of the race before passed by Parklife, who soon relinquished the lead to Piepowder Court before regaining a narrow advantage with Jintshi battling him for the lead. However, in behind, Secret Trade was making relentless progress under Antonio Fresu with the pair hitting the front 100m out and running powerfully to the line to register a third career success. The opening 1400m handicap, restricted to horses in private ownership, was won narrowly by AF Mozhell, owned and trained by Khalifa Al Neyadi, celebrating his third winner this season. Elione Chaves, doubling his tally for the campaign, settled the 4-year-old just behind the early leader, AF Makerah, before gaining the initiative approaching the 200m pole, immediately seeing off that rival only for Nawwaf KB to emerge as the big danger. Zahi Muscat had to dig deep for Ben Curtis to land the 1800m maiden, his tenth career start, but just third in the UAE after two turf outings on the Abu Dhabi turf. Previously trained in Oman, his first seven starts were all at Muscat, on dirt, finishing second on four occasions. 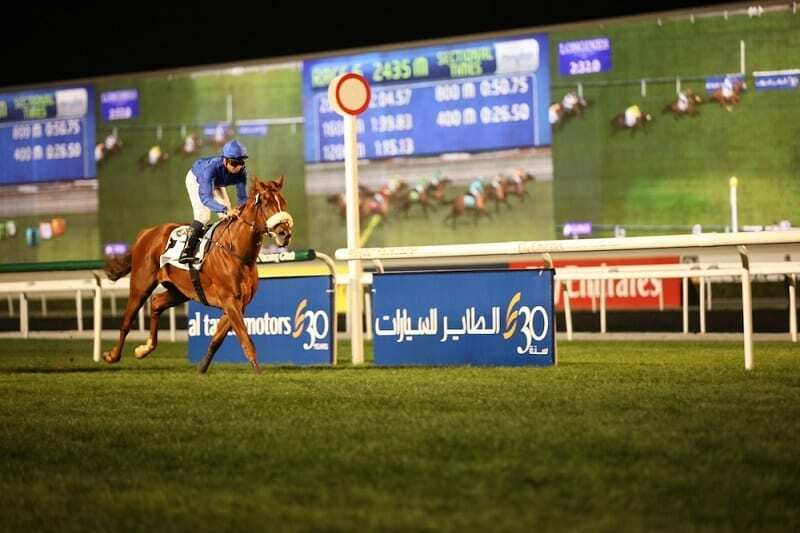 Saddled by Younis Al Kalbani for Muscat Stud For Pure Arabians, the 4-year-old was involved in a prolonged battle throughout the straight with AF Eshaar, who was sent straight to the front by Fresu. Having finally fought his way past that rival, who eventually finished sixth, he then had to withstand a determined final challenge from his stable companion, Al Thoura, who has now finished second on all three racecourse appearances, each at Al Ain, twice over this 1800m and over 1600m on his debut in December. “He really put his head down and battled for me and was probably getting lonely in front,” Curtis said. The concluding 1000m handicap went to Al Mobher, who tracked the pace set by Fresu and AF Thobor, another to run well for Oertel and Al Nabooda, before wresting the lead from him inside the final 350m with the pair probably occupying first and second throughout. Partnered by Szczepan Mazur, sporting the colours of the Omani Royal Cavalry, Al Mobher was completing a double for trainer Al Kalbani.